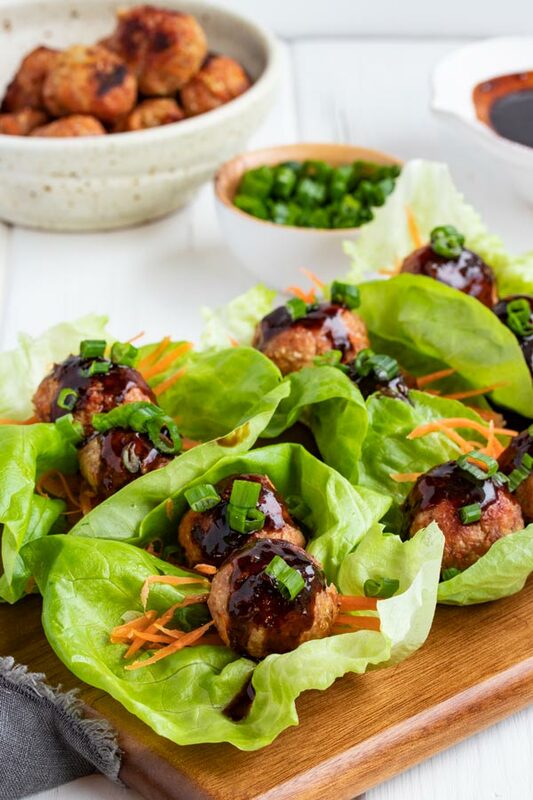 These Asian meatballs in lettuce wraps make a great appetizer or light lunch or dinner. They’re healthy, low carb, and taste just like pork gyoza but without the hassle of wrapping and folding! If you like gyoza, but you kinda feel like wrapping them is either too hard, too much work, or too time consuming, you are in luck. 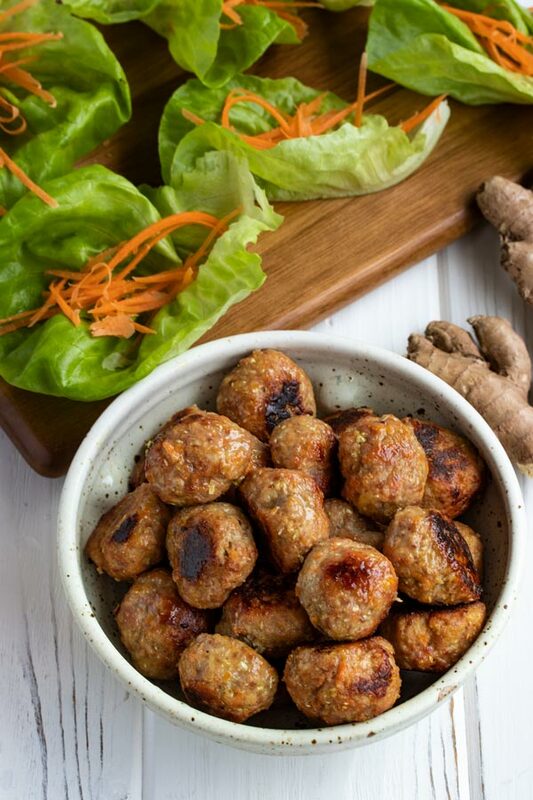 These Asian meatballs are made with the exact same ingredients as our super popular homemade gyoza recipe and they take a fraction of the time and effort. Not only that, but the sauce that tops these lettuce wraps is the same amazing dipping sauce that we make for our gyozas, but in this case, we thicken it slightly. This dipping sauce is the best! 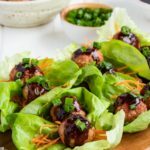 We love these Asian meatball lettuce wraps and because they are low carb, we can eat a ton of them and not have to worry about our waistline! 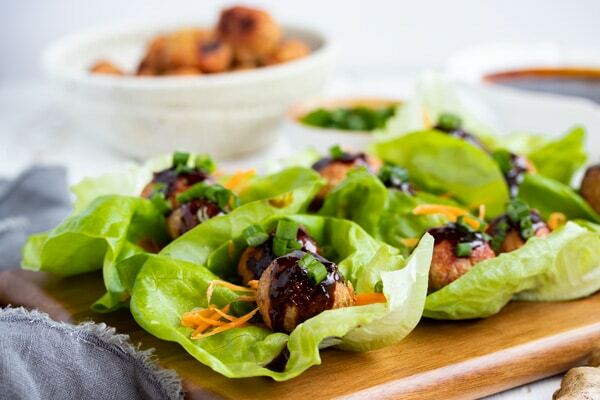 There are two ways to serve these lettuce wraps. Both are equally good, it just depends on your preference! First, you can serve them as we have pictured in this post. As lettuce wraps with julienned carrots, green onion, maybe some chilis, and the sauce drizzled on top. This is a great option if you are serving these for lunch, dinner or to a small crowd as an appetizer. 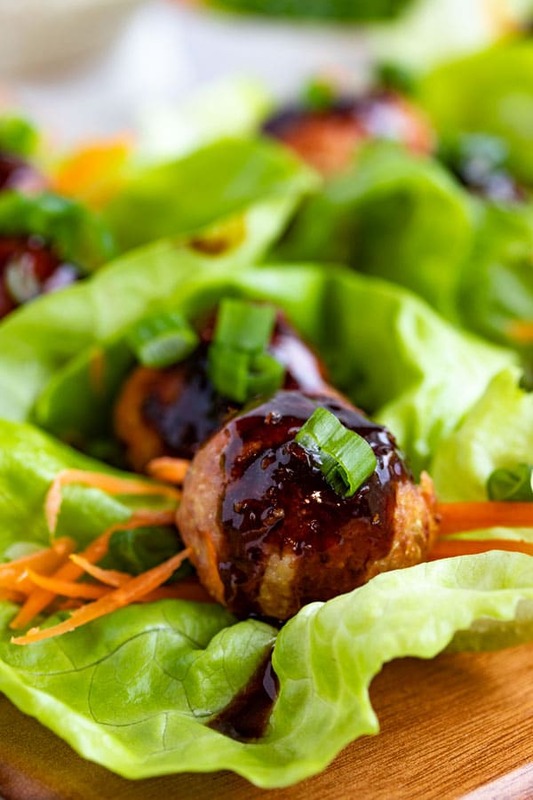 Second, you could also serve them just as meatballs, without the lettuce wraps and extra veggies. Just put them in a wide shallow bowl or serving dish and drizzle the sauce over them so they get all coated and then serve with mini forks. If you choose to serve them like we did, as lettuce wraps, you can either pre-make the lettuce wraps on a big tray or you can have all the toppings and the sauce set out in separate bowls so your guests can make their own lettuce wraps. There are also two ways to cook these Asian Meatballs. On the stove or in the oven. 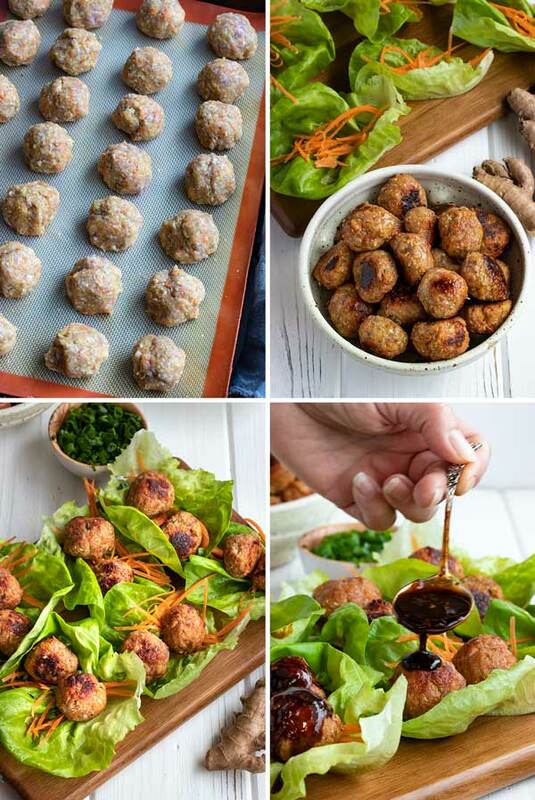 The oven is the easiest way since you can do all the meatballs at once, however the stove top method gets the meatballs nice and browned and crispy. First, shred your cabbage with a food processor. Small pieces of cabbage make mixing the meatballs easy. You can shred your cabbage with a hand grater as well, but a food processor does a nice job of mincing it. Slicing by hand doesn’t work nearly as well. Put all the meatball ingredients in the food processor and pulse until the mixture is combined and the cabbage is shredded nicely. You might have to do this in two batches. If so, mix the two batches together well when they are done. Take a slightly smaller than golf ball size scoop of the meatball mixture and roll it around in your hands until it becomes a smooth-ish ball. You want your meatballs to be about 1 1/4 – 1 1/2 inchs in diameter. Place on a parchment or silicone lined baking tray. This recipe will make about 25 meatballs. OVEN METHOD: Heat your oven to 400 degrees. When its at temperature, place your tray of meatballs in the oven and cook for about 12 mins. Remember that every oven is different and this timing is only approximate. The best way to tell if they are done is to cut one in half or check the internal temperature. They are done when there is no more pink in the middle or if a thermometer reaches 165 degrees in the middle of the meatball. STOVE METHOD: Heat a large skillet to medium. Add a tablespoon or two of oil to the pan and when the oil is hot, add some meatballs without crowding the pan. Cook till browned on all sides and there is no pink in the middle. You may have to do this in batches as all the meatballs won’t fit all at once. They are done when there is no more pink in the middle or if a thermometer reaches 165 degrees in the middle of the meatball. SIDE NOTE: this All Clad stainless steel skillet is our absolute favorite skillet for browning meat. If you haven’t tried a stainless steel pan yet, we urge you to give them a try. They are easy to clean, don’t have any toxic coatings, and they have really nice even heat. 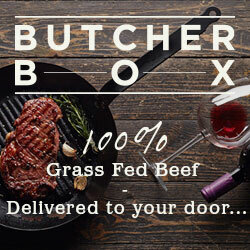 Check out this post to see other cookware we love and why. You can pretty much use any lettuce you like for these lettuce wraps, however there are a few different kinds that work and look the best. Buttercrunch – our favorite because the leaves are just big enough to fit a couple meatballs and they are shaped like little cups. Living lettuce – we love this lettuce because they are sold with the roots intact which keeps the lettuce fresher for longer. Iceberg – nicely shaped and with a nice crunch! The leaves are a little large, but you can overlap the edges of the lettuce wrap. Romaine – this lettuce has great flavor and crunch, the only thing is the leaves can be quite large making lettuce wraps for meatballs a bit tricky. In a sauce pot, mix together the rice vinegar, soy sauce, garlic, ginger, sesame oil, green onion and chili flakes. Turn your stove to medium-low and start to heat the sauce. Make a slurry by mixing 1 tsp of cornstarch with 2 tablespoons of water and mixing until there are no lumps. Add the cornstarch slurry to the sauce while whisking quickly. Cook until the sauce starts to simmer and thicken slightly. You only want the sauce to barely coat the back of a spoon. You don’t want it too thick. Remove it from the heat and set aside to cool completely. TIP FOR THE SAUCE: make sure to only use low sodium soy sauce and we prefer the light soy sauce to the very dark. Otherwise your sauce could end up being quite salty. 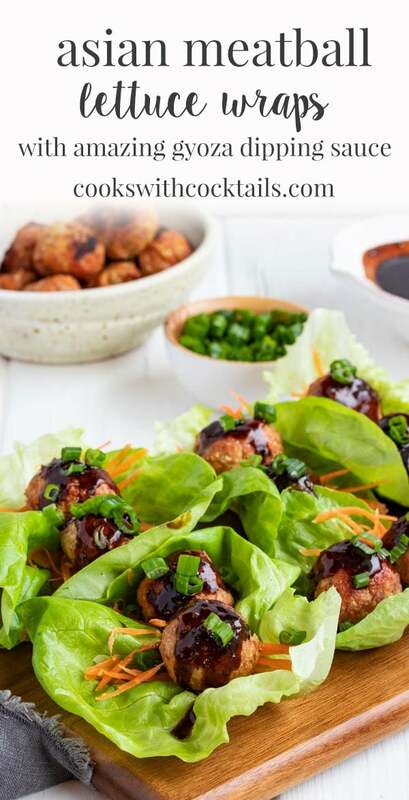 If you’ve tried this Asian meatballs lettuce wrap recipe then don’t forget to rate the recipe and let us know how it turned out in the comments below. We love hearing from you! Make a slurry by mixing 1 tsp of cornstarch with 2 tablespoons of water and mixing until there are no lumps. Add the cornstarch slurry to the sauce while whisking quickly. Cook until the sauce starts to simmer and thicken slightly. You only want the sauce to barely coat the back of a spoon. You don't want it too thick. Remove it from the heat and set aside to cool completely. First, shred your cabbage with a food processor. Small pieces of cabbage make mixing the meatballs easy. You can shred your cabbage with a hand grater as well, but a food processor does a nice job of mincing it. Slicing by hand doesn't work nearly as well. Put all the meatball ingredients in the food processor and pulse until the mixture is combined and the cabbage is shredded nicely. You might have to do this in two batches. If so, mix the two batches together well when they are done. Take a slightly smaller than golf ball size scoop of the meatball mixture and roll it around in your hands until it becomes a smooth-ish ball. You want your meatballs to be about 1 1/4 - 1 1/2 inchs in diameter. Place on a parchment or slipmat lined tray. STOVE METHOD: Heat a large skillet to medium. Add a tablespoon or two of oil to the pan and when the oil is hot, add some meatballs without crowding the pan. Cook till browned on all sides and there is no pink in the middle. You may have to do this in batches as all the meatballs won't fit all at once. They are done when there is no more pink in the middle or if a thermometer reaches 165 degrees in the middle of the meatball. Julienne the carrots or slice them up really thin, or even grate them. Slice the chili and the green onion. To server, place two or three meatballs on each lettuce leaf. Top with the carrots, chilis if you like, and green onion. Drizzle with a little bit of sauce and serve!